Not much has gone right in the Mets' bullpen staff to begin the season, but the former Mariner has been as advertised in the closer role. Diaz now has a 1.17 ERA and 14:2 K:BB through 7.2 innings, and he has yet to blow a save opportunity. Diaz made things a bit interesting, allowing a leadoff single and then a double with two outs. However, he managed to strike out Freddie Freeman -- who represented the tying run -- to end the game. Though his 1.24 WHIP is inflated from his exceptional results last season, Diaz figures to remain an elite closer and already has 10 strikeouts in 5.2 innings of work. Diaz is now 4-for-4 in save opportunities and has given up only two hits and a walk over 3.2 innings. The 25-year-old has been as good as advertised thus far after being acquired from the Mariners in December. Diaz got Curtis Granderson -- who represented the tying run -- to fly out to end the game. 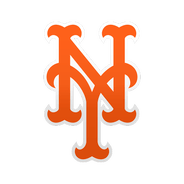 He was called in after the Luis Avilan and Robert Gsellman allowed a combined four runs to the Marlins in the ninth inning. Diaz already has three saves this season, pitching just 2.2 innings to earn them.